A quilt artist, known for her expert use of color and machine stitching, needed a complete identity system, website, and marketing materials for her studio and workshop. Since the clothes of dedicated quilters are often covered with little leftover bits of thread, the business card includes an actual thread applied to the card. In order to highlight the quilts, the website uses close-up details on each page. 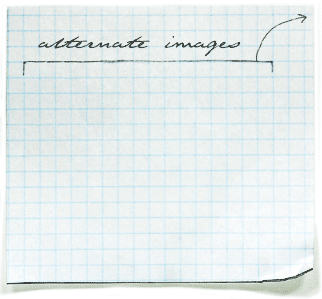 The quilt imagery is random, providing a fresh experience during each visit or page reload. The bold background pattern is based on a quilt design done by the artist, and was optimized for web usage. The modular marketing brochure system was designed to be flexible and customized by the studio. 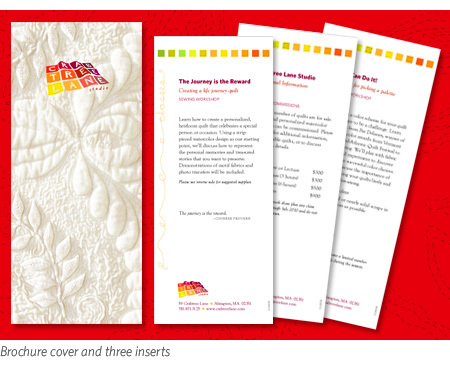 A tri-fold “shell” shows detailed stitching from a quilt, provides contact information, and continues the use of the bold background pattern used on the website. We then designed a series of one-page sheets which fit inside the shell—the quilter’s resumé, price list, individual classes, etc. Crabtree Lane Studio is able to print and send highly-targeted information to each quilt guild or other prospect.